The history of separate pediatric care in Banská Bystrica started after World War II. A separate children's department was established and MD. Pavol Fabián becomes its first head physician, who led him until 1974. Later on, the department moves to Roosevelt hospital, with 56 beds. Even then, the beds were divided into section of infants and section of toddlers with big children; newborns have been treated separately. Since the beginning, the most serious diseases of children have been treated at the department, especially from the current Banská Bystrica region. We talk about respiratory disease, diarrheal diseases, tuberculosis, rheumatic fever, diphtheria. In the 60s, Fabián builds up a modern pediatrics and specialized pediatric primary care units for children. Doctors are struggling with high infant mortality. In the second half of the 60s, there are pediatric cardiology, nephrology, rheumatology, endocrinology and pneumo-allergology outpatients units within the department. During the first half of the 70s the development of critically ill neonates and preterm babies care begins. Prof. MD. Svetozár Dluholucký, PhD. leads the department since 1974. Based on new knowledge and practices, the Middle Slovakia region has the lowest infant and neonatal mortality in Slovakia. In 1972 the speleoclimatic treatment starts to operate in Bystrianska Cave, for asthmatic children. Up to date, this is the only research and reference point of international UIS. The second half of the 70s is a beginning of modern integrated care for children with oncological diseases. Cancer diseases have been centralized progressively, outpatients departments have been grown and in 1983 the Ministry of Health has established the Cancer Center of the Middle Slovak region - first in Slovakia. At the end of 70s, the research of the congenital hypothyroidism screening is initiated. This was successfully completed on 1st January 1985 with the setting up of the Newborn Screening Center SR (the first national screening of hypothyroidism in the states of so called "Socialist camp"). Currently, the NSC SR carries out the screening of hypothyroidism, phenylketonury and congenital adrenal hyperplasia for all live births in Slovakia. 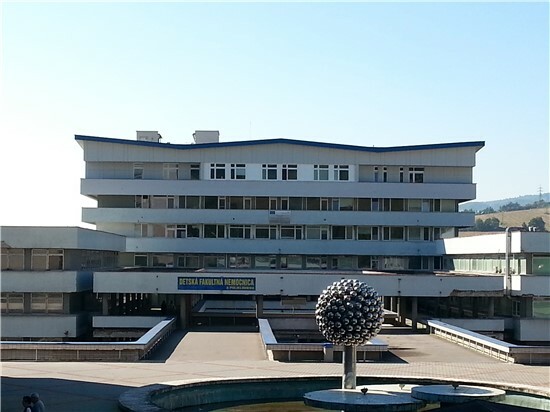 In 1982 the department moved into a separate pavilion in so called “new hospital” with 101 beds. All existing units have been developed including the development of the care for critically ill children. The complex treatment of poisonings, including Amanita phalloides poisoning has been developed as well, together with severe head and brain trauma, state of breathlessness status and clinical death. The dialysis had come into practice and the program of kidney transplant for children was developed. The transport of critically ill children has also been improved. Pediatric department had the first "flying pediatric team" in Czechoslovakia already in 1984. The activity of organ removal and organ transplantation for children has increased as well. Since 1991, the department was given the status of Pediatric Clinic of Slovak Medical University in Bratislava. Since that time the hospital performs educational activities in teaching and further training of doctors and nurses. It is improving the scientific and research activity. The December 28, 2004 is another milestone. By the decision of the Minister of Health, this body has changed into independent Children`s University hospital - third in Slovakia. It integrates all services in child care, which we want to introduce on these pages.